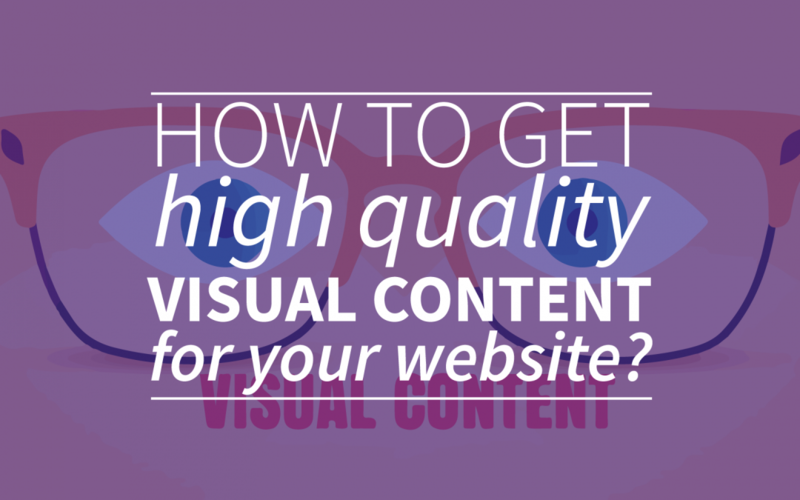 How To Get High Quality Visual Content For Your Blog? If you’re writing your own blog, whether it’s a business blog or a personal one, you probably need some visual content to support your writing. Most of the times you’ll search for photo’s and end up with some stock photo’s which you’ve seen a million times before. Or you risk using copyrighted illustrations, just because you think nobody will sue you for using their pictures. But, why would you? It’s not that hard to get high quality images and illustrations for your blog, so kick out your stock photo’s and use one of the following tips for creative and free visual content! Where to find your visual content? There are a lot of pictures on the Internet that you could use for free, just by giving the makers of the pictures a little credit; the so-called pictures with Creative common. If you use pictures with a creative common license in your blog, you’ll be able to give your readers some nice and relevant visual content without any costs. There are multiple creative common licenses, all to be found on this special flickr page! Make sure you read the terms and conditions, you don’t want to get in trouble for ignoring them! Why rely on the pictures from someone else? You can take some pictures yourself! Even though your not a professional photographer, you probably know exactly what kind of visual content your blog needs to be more powerful. Especially when you’re writing about your personal life, there is better you than your own pictures. So try to find out about your own photography talents and share them on your blog! This is also another way to show your personal style and why you differ from all other bloggers; your pictures will be as unique as your writings. If you can’t find interesting creative common pictures and you don’t feel like taking some pictures yourself, you could consider using a illustration, info graphic or schemes to support your blog. Pictures are not the only way to illustrate your blog. In fact, info graphics, illustrations and schemes can be even more effective if you use them the right way. Keep in mind that also these visual contents could be copyrighted. So be careful! If you want to be sure that your illustrations, info graphics and schemes are relevant and not copyrighted, you could also consider to make your own! Why should you use just pictures if you could give your audience a bit more of an experience? Especially when you consider that people prefer to sit back and watch something instead of reading. Video is the solution! You could create your own video(blog), but the Internet is full of audio-visual content, so why not borrow some useful video’s from other people? It’s actually quite easy, because if you just embed your favourite YouTube video, you won’t have to think about copyright. So videos are an easy way to add some visual content to your blog without a lot of hussle. Although above tips are all ways to get around copyright content, but what to do if you find a really great one that you want to use? Just be fair and ask the one who made the picture, info graphic or illustration. You can always try to get permission. Most of the people will appreciate the fact that you asked. We won’t say that every photographer would say ‘Yes!’ to your question, but at least you can try right? This prevents a lot of trouble afterwards. Like showed above there is more than enough beautiful visual content on the world wide web available for you, you just need to know where to find it. So kick out your stock photos and give your blog some creative refreshments! Because good visual content will complement your writings.